I’m having so much fun showing her room little by little as we put it together. 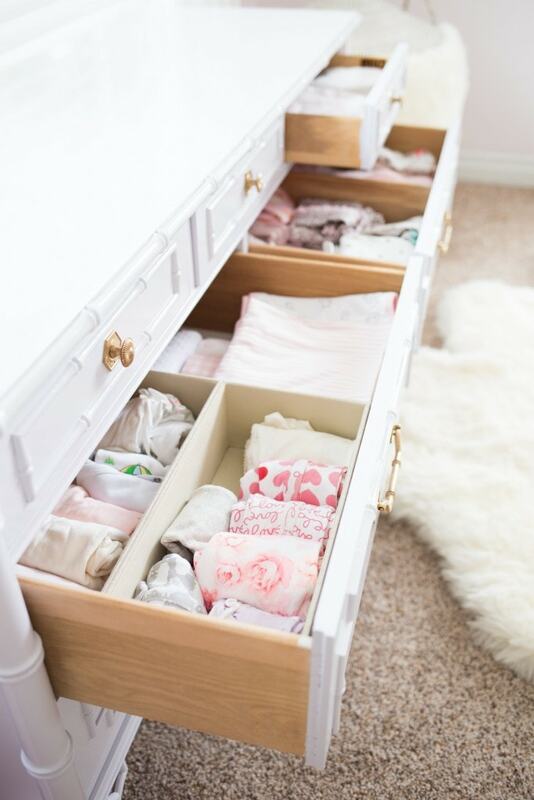 I knew I wanted to reveal her nursery once she was here as I’m sure we will get so many sweet little additions at showers before her arrival. 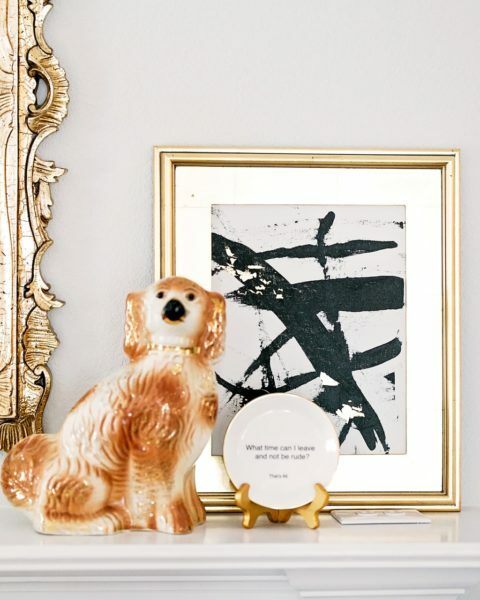 But realistically, a room doesn’t come together overnight, and I didn’t want to portray that either. I mean seriously, it does NOT come together overnight and furniture shipping companies are not on my nice list this season. 😉 We’ve had three pieces delivered, arrive damaged, sent back, refunded, reordered, reshipped, etc. 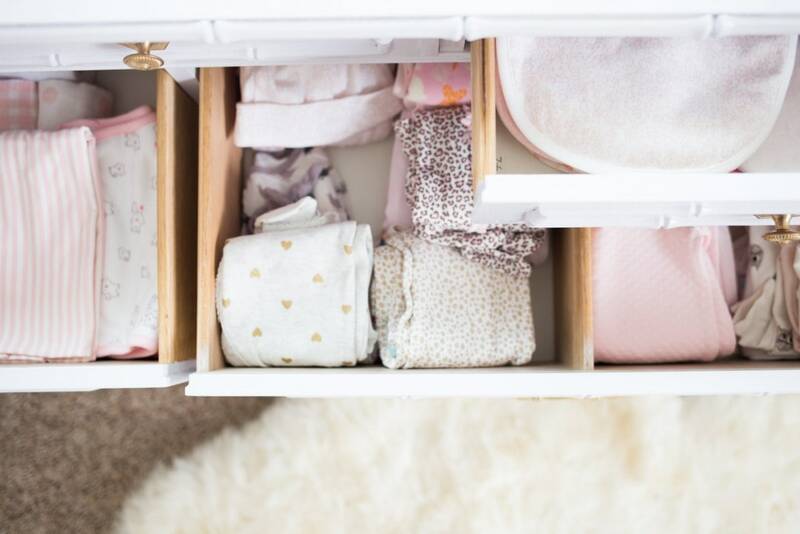 Thankfully, this changing table featured was the easiest piece to deal with! haha. They come in your home and deliver it themselves so that was the least of our worries. I hope you enjoy seeing this process step-by-step as much as I do! 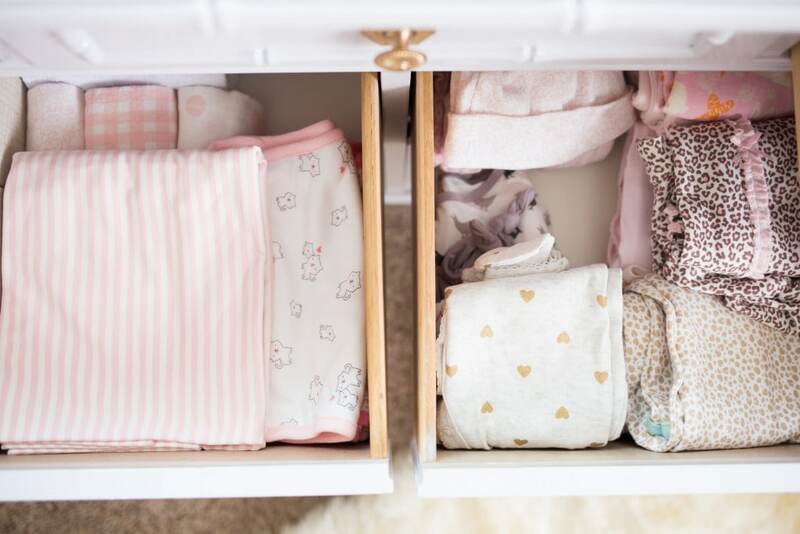 For our next addition we added her changing table. I was going a little nuts with all of her gifts and onesies just lying around on the floor. I kept thinking I would have baby brain and forget we already have something or lose a gift. 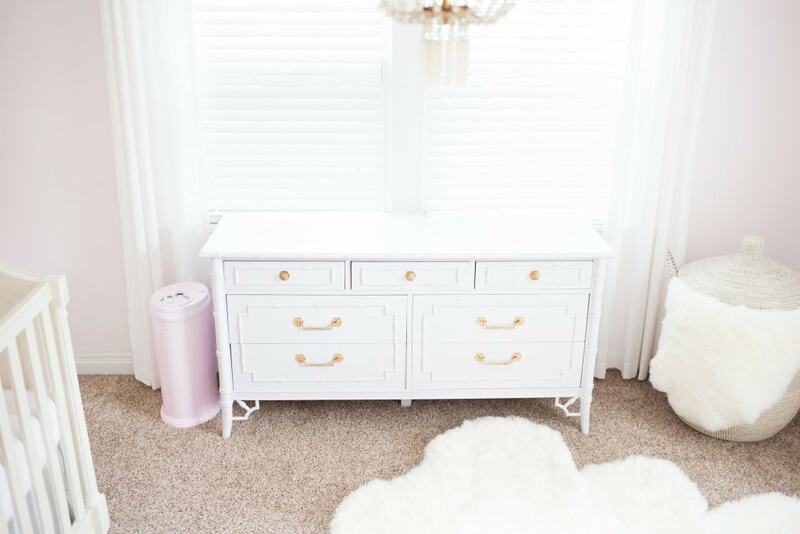 I went with a dresser from The CEH because I wanted to make sure most of the furniture we buy her now can transition to a big girl room one day! Unless she is a total tomboy and hates lavender, in which case I will gladly take this off her hands! haha. 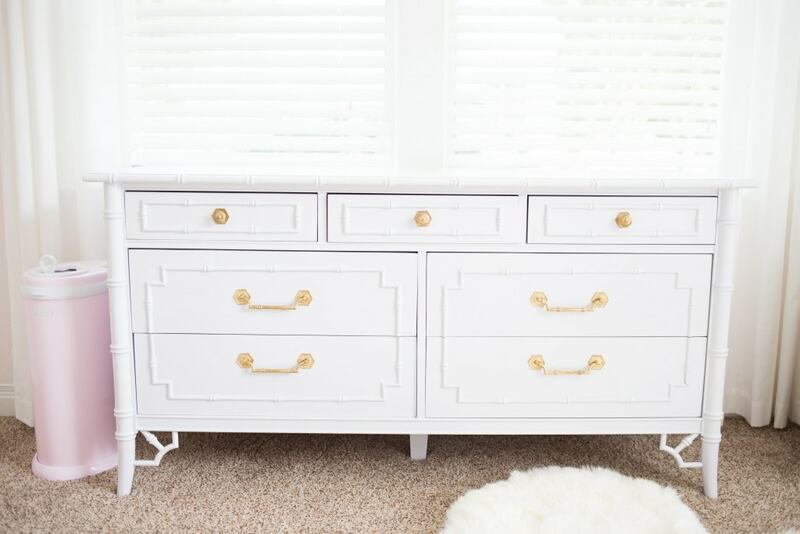 The CEH is a company out of Dallas that makes high-end vintage furniture by adding lacquer, stain or paint and bringing it back to life. And besides our parents, I think they were the second people to know we were pregnant! haha. 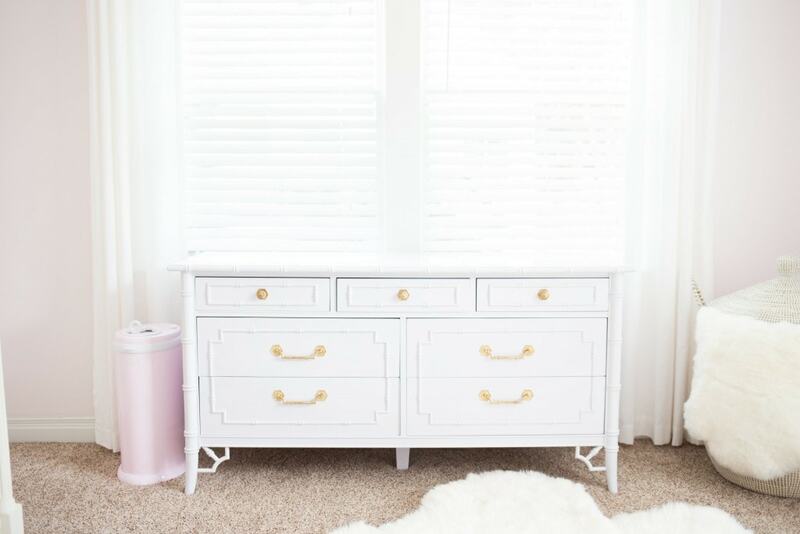 A lot of my friends in Dallas use them for changing tables with dressers so I e-mailed them, put a deposit on this dresser and had them hold off for weeks until I got the results back from what the gender was! haha. If we had a little boy my plan was to do navy and then transition it into a future home in Paul’s office. 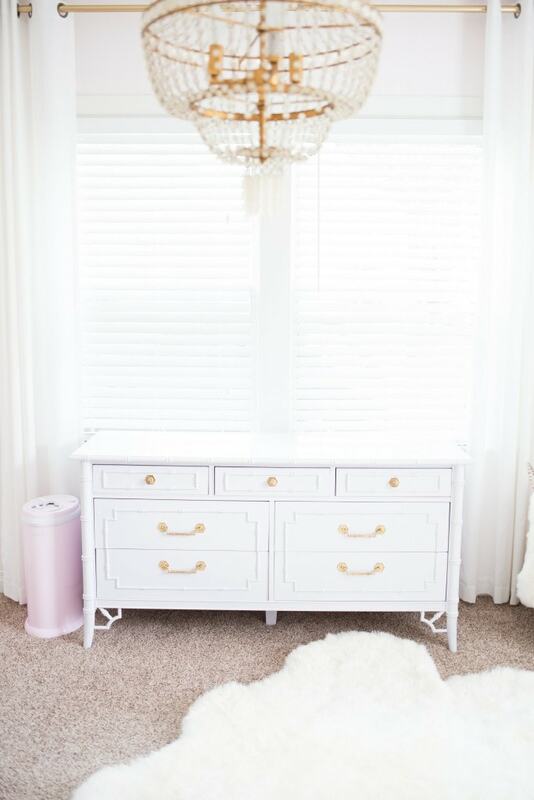 When I found out we were having a little girl I knew I wanted it to be lavender as a way to incorporate my wedding dress in her nursery. How ridiculous am I?! 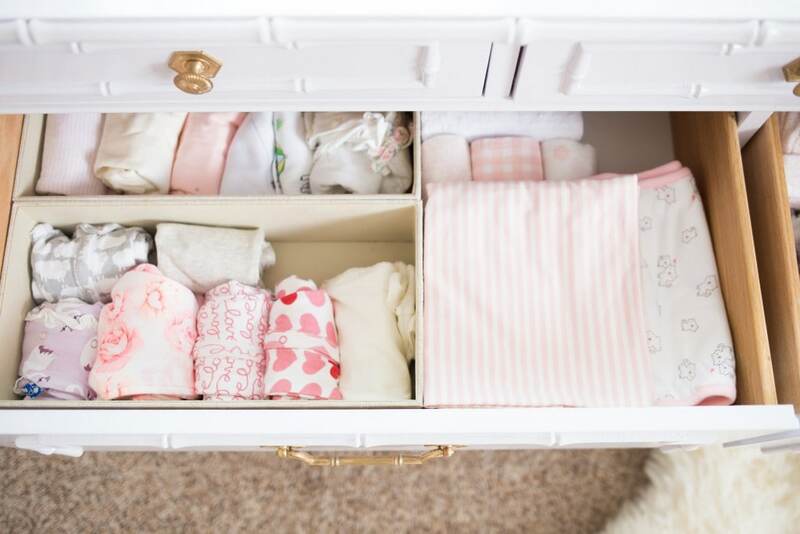 Ordering a changing table before I even know the gender! Please don’t answer that. We also went with the Ubbi Diaper Pail after all my girlfriends said that was the one I “hadddddd” to get, so I followed their orders and bought it off of Amazon. haha. This phase of life is seriously so much fun as all of my friends have girls right now. From my best friend with an 18-month old girl to 4 of my girlfriends having had girls this year. They are going to have the best play date groups! And now it seems as it every single day one of my girlfriends is calling me to tell me she is pregnant. It’s really neat to see how the Lord works his timeline out perfectly. A year ago [to next week exactly] I was having surgery knowing it would take me 5 years to get pregnant [which is what I had been told since I was 12 having emergency ovarian surgeries.] And now we are having a baby a lot sooner than 5 years and all my best friends had girls or they just found out they are pregnant. Not to get too sappy on you or anything, it just is a really sweet feeling knowing his timing is better than we could ever imagine and something that makes this Thanksgiving feel even better! Thank you so much for reading and spending time with me today! Is the dresser lavender? It is reading white on my screen. I love the idea of customizing vintage furniture and I am going to see if they have a similar store in my town. 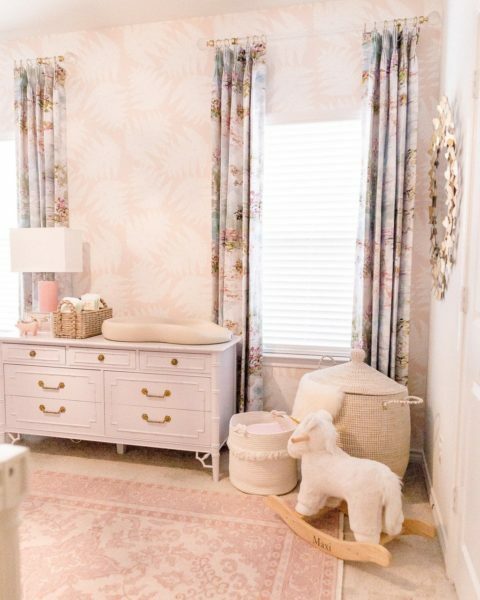 Also love the furry rug/throw in the basket. Such feminine touches! Yes ma’am! The shade is iced lavender I believe! 🙂 It’s just very light in the room so I think it makes it look brighter! 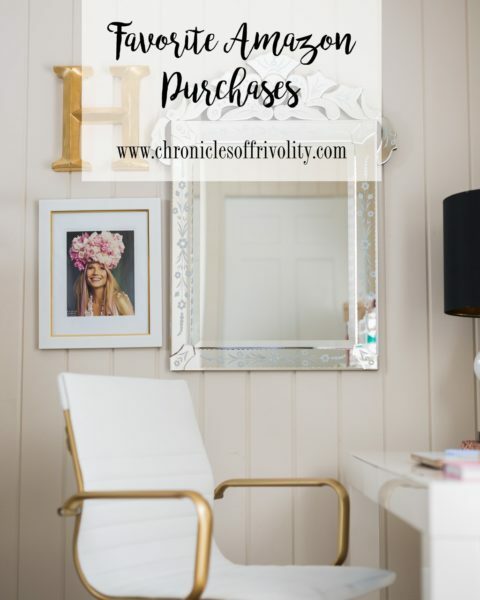 Wouldn’t it be great if all furniture sites would deliver to you directly. Being pregnant, that’s one less stress for you that I’m sure is so appreciated! Also, you are so right about his timing!! Loved reading this little update! Awww I love that its lavender! Although it looks white on screen but I can only imagine how cute it is in person! So so sooo sweet & exciting! I love seeing all the updates! 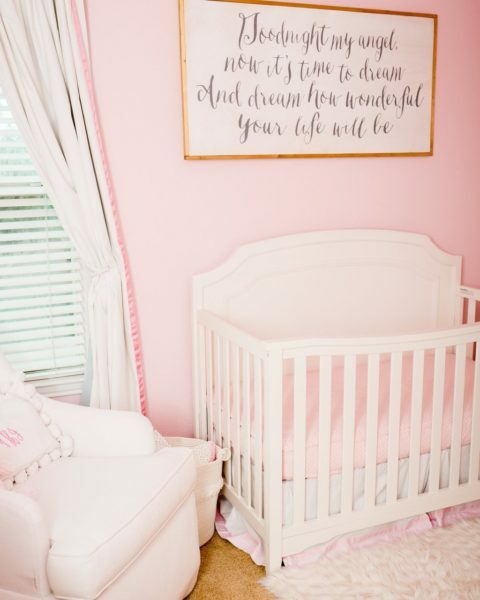 You are basically designing what I’ve always had in my head as my dream nursery! Wow! 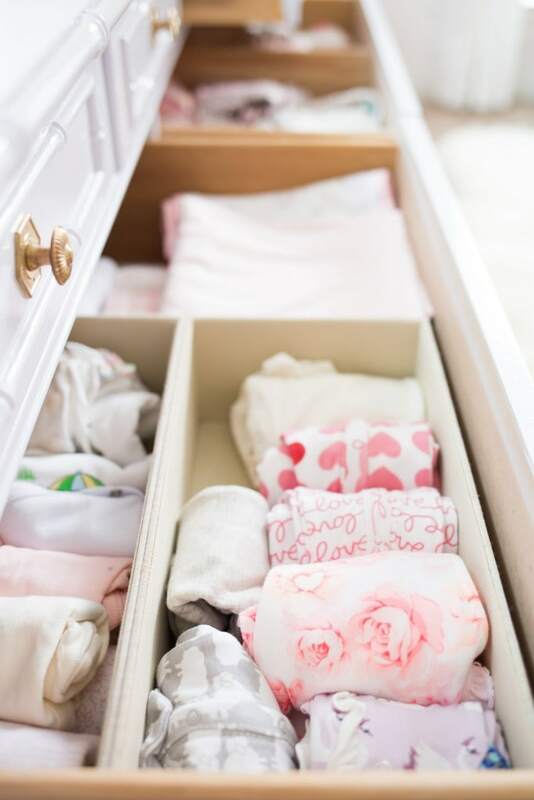 I would never have guessed that dresser is lavender! It looks white! Regardless, I love it! I want it for myself! lol Can’t wait to see the rest of the nursery!! 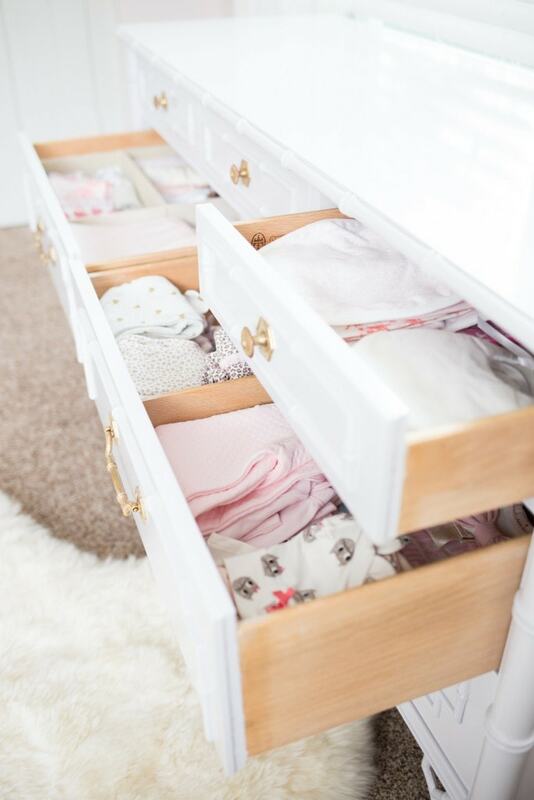 That dresser is so pretty- gorgeous for a nursery! Is that the 3×5 or 4×6 rug? Love it so much!